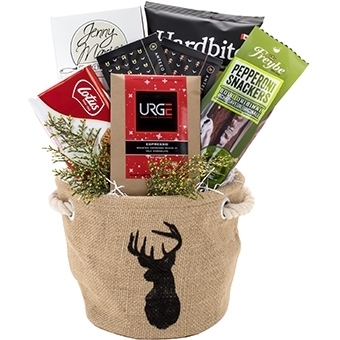 Share the wonders of the Holidays with this sparkling holiday gift basket. The Winter Wonderland comes filled with: Urge Espresso chocolate, Jenny Marie crackers, Lotus cookies, pepperoni snackers, Anteeo tea and Hardbite chips. As with all our Holiday gift baskets, the Winter Wonderland gift arrives beautifully decorated, wrapped in cellophane, topped with a matching hand tied bow and includes a gift card with your message. All gift baskets on www.pacificbasketco.com are exclusively designed and made by Pacific Basket Company.